While Hattiesburg was hit pretty hard by Hurricane Katrina — certainly harder than a community 75 miles inland is typically struck by a hurricane — it didn’t suffer nearly the damage that the communities further south sustained. On the other hand, though, the Hattiesburg area wasn’t as diverse economically as New Orleans, Gulfport, and Biloxi. The main “white collar” industry in Hattiesburg is the University of Southern Mississippi (aka Southern Miss), and there is also a hospital. Most of Hattiesburg is working class: many jobs are military (National Guard base Camp Shelby is nearby), industrial (there are plants for Pepsi and Budweiser, as well as some local industry such as a foundry), and service sector (small shops and restaurants, and of course Wal-Mart). One of the women working with us to do her “sweat equity” in order to qualify for one of the Habitat homes told us she was a Nurse’s Assistant. 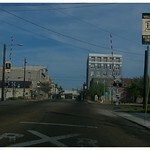 Check out our photos of Hattiesburg, including some photos of remaining hurricane damage. The Hattiesburg Area Habitat for Humanity affiliate had been building homes at a rate of 2-3 per year. 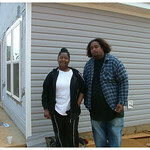 The street we were working on had about 7 of these homes, which already had low-income families living in them. Once the hurricane rebuilding effort got underway, the affiliate seized the opportunity and set a goal of building 40 homes per year. So far this year, they had built the two homes that were currently the volunteer bunkhouses (though one would have a family move into it in April), plus the three existing “in-process” homes that were there when we arrived, plus the one we started the week we were there — all this by mid-March! With the help of weekly teams of volunteers and donations coming in like never before, the Hattiesburg Area Habitat for Humanity is able to offer safe, decent housing to families who would not previously been able to think of such a thing. Some of them were evicted from apartments after Katrina when the landlords determined that it wasnÂt worth fixing the hurricane damage. Some of them may have lost jobs when their employers closed or had to cut back after the disaster. Others are simply hardworking low-income families who are living through an ongoing unrelated pre-and-post-hurricane economic disaster. Kudos go to the incredible staff at the Hattiesburg Area Habitat for Humanity, who we were fortunate to work with while we were there: the Site Manager, Mike, and Site Supervisors Earl and J.R., and staff member Natacha, who wears many hats trying to identify families, coordinate volunteers, and raise funds for the affiliate. 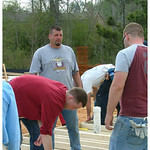 Visit their website and find out how you can contribute at http://www.hattiesburghabitat.org/.